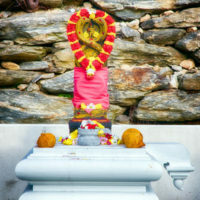 Note: The Krishna Janmashtami Puja is held in the Temple. Krishna is the ultimate incarnation of divinity into a human body. He is the highest form of divinity that has anything to do with relativity. In the Bhagavad Gita, while he is enlightening Arjuna, Krishna reveals that he is God himself, the source of everything. Krishna is the eighth incarnation of Vishnu. 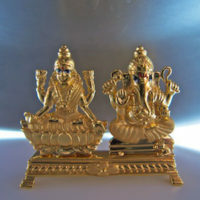 Vishnu is the name given to the cohesive tendency known as the sattwa quality. The Vishnu tendency brings everything in the universe towards increasing cohesion, increasing concentration, increasing existence, increasing reality, increasing light, and increasing truth. Krishna Janmashtami is an important day in the Vedic calendar. 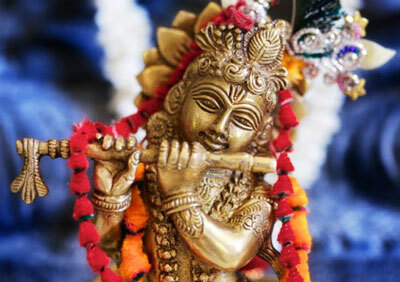 Krishna Janmashtami is also known as Krishnashtami. Sri Krishna was born on the eighth day (Ashtami) of the Vedic month Shravanmaas, which falls in mid-August or mid-September every year. The ritual for this celebration is to fast on the previous day (This is on the seventh day of the Vedic month (saptami)) which is followed by a night-long vigil commemorating the midnight birth of Krishna. 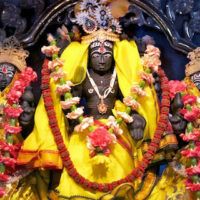 Traditionally, at midnight, the idol of the infant Krishna is bathed and adorned in new clothes and jewelry, placed in a cradle, and worshipped. The fast is completed after aarathi and a special prayer. At daybreak, ladies draw patterns with rice-flour paste of little children’s footprints outside, walking towards the house. This symbolizes the entry of Lord Krishna into their homes. One who worships at the lotus feet of Lord Krishna on this highly auspicious day gains his blessings, prospering spiritually and materially.